The Chausey Islands make up the largest European archipelego. It is composed of La Grande Ile, the main island and 365 islands at low tide, compared to only 52 at high tide. There are a few dozen homesteads on the island, which is linked to the continent by shuttle boats, depending on the time of the year. 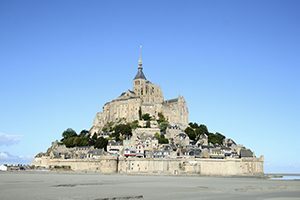 The archipelego used to be quarried for granite – its stones were used to build Saint Michael’s Mount Abbey and in the reconstruction of Saint Malo. Dieppe’s quays, London’s paving and Paris’s pavements were also cut from the island’s granite. The « Les Rhumbs » villa was Christian Dior’s childhood home. Now it ‘s been made into a place of memory, dedicated to promoting the fashion designer’s life and work, from his early days up to when his fashion house was known worldwide. Every year since 1977, the museum puts on a temporary exhibition on fashion linked to his work. Objects from its permanent collection are shown in autumn and winter. 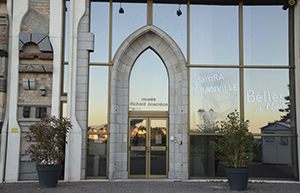 Granville’s inhabitants consider Carnaval like Christmas or Easter. This satirical and humoristic winter tradition is one of the region’s biggest events : 350 floatmakers, 2 500 carnaval makers and 100 000 visitors over 5 days, around 40 floats, 15 brass bands, 3 kilometers of parade, tons of confetti… Carnaval probably has its origins in the XVIIth century – celebrating the cod fishermen’s departure towards faraway Newfoundland. V-shaped fish traps are used to capture fish and some seafood : cuttlefish, spider crab, shrimps, sardines, mackerel, plaice and sole… The earliest vestiges of the Cavey fish-traps, on the Plat Gousset beach, are as old as 12th century. On the Manche’s coast one finds two types of fish-trap : public wooden traps and private stone traps. Granville’s traps are of stone. At low tide the ecologically-rich beach is a playground for shellfish pickers. Between Granville and Saint-Jean-le-Thomas, in particular around Hacqueville toGranville and beneath the Champeaux cliffs, the beaches are very busy at very low tides. Hundreds of amateur pickers seek clams, winkles, whelks, shrimps, lobster, oysters, wild musselsand crabs here. Granville is the France’s first whelk port. Seafood lovers appreciate the whelk (Buccinum undatum) , which is a carniverous gastropod mollusc found on shallow coasts. It spends most of its time burrowed and immobile and uses its (edible) foot to move and feed. The Bay of Granville whelk has the blue Marine Stewardship Council sustainable seafood label. Many beaches with turquoise waters are to be found between Breal and Saint-Jean-le-Thomas. Whether long beaches of fine sand or little hidden creeks, there are beaches to suit all tastes and they are great for relaxing, sea-bathing, walking or sandcastle-making. In the centre of Granville, the Plat Gousset beach is a marvel. The views above of amazing villas add to its charm. The town’s casino is opposite the beach. Saint Michael’s Mount is one of France’s most-visited monuments. Its also a worldwide symbol of France. The cult of Saint Michael on the mount started in 708 and it became one of the most important centres of medieval pilgramage. Benedictine monks built an abbey there in the 10th century. The mount and the abbey were one of the first monuments registered as UNESCO World Heritage sites. The city of Coutances is known throughout the world for it’s Jazz festival Jazz sous les Pommiers. It was once capital of the Cotentin and has a number of historical monuments to be discovered by walking through its streets. The cathedral is a very good example of Norman gothic, with its beautiful lantern tower and very bucolic botanical garden. Its medieval and bourgeois neighbourhoods are particularly charming. This museum was set up in Cherbourg’s former transatlantic ferry terminal and lets you dive into the maritime world. Here you’ll discover the history of the exploration of the underwater world and get to know the treasures found in the deep waters. Here, you can see the biggest visitable submarine in the world – the « Redoutable » is 128 metres long. 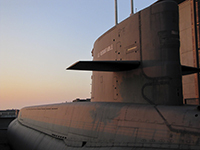 The museum also offers an exhibition on the development of submarines over the years, a fun trail for children, an interactive area and a navigation simulator. This traditional foundry makes monumental bells, church bells, carillons, ships’ bells, trophy bells, household bells and clocks, as well as statues. In the workshop you may find bells for the Normandy market alongside those that will leave to Egypt, the USA, Haiti, Japan and Armenia. Each year around 100 bells are made here. Saint Malo’s legendry past is to be felt in its streets, monuments and museums. This famous city has always been oriented towards the open sea. It offers quaint shops, sunny café terraces, walking on the old town’s ramparts and bathing in the turquoise sea, as well as hosting cultural festivals and sporting events such as the Route du Rhum, Étonnants Voyageurs and the Route du Rock. Here you can retrace the footsteps of personalities such as Chateaubriand, Surcouf and Jacques Cartier. In the heart of the Normandy countryside, this town brings together rural charm and an out-of-the-ordinary architectural and craft heritage. It is known worldwide for its craftsmen specialised in copperworking, copperware and artistic metalworking and is home to the Cornille Havard bell foundry, created by Adolphe Havard in 1865. Today, the foundry is one of just a few of the world’s specialists in bell art.